Why Say More When You Can Say Less? 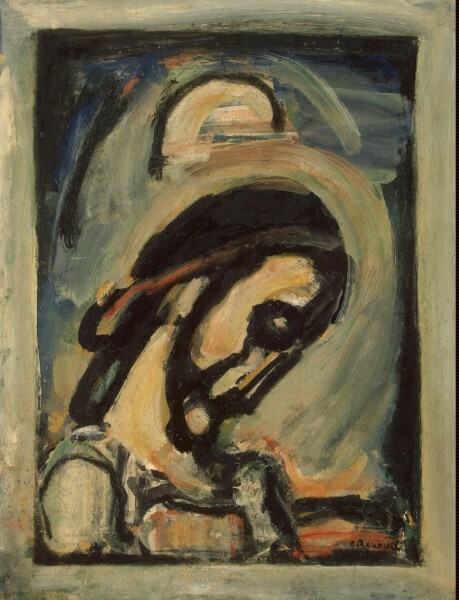 The Art of Georges Rouault. One of the artist’s whom I have discovered that moves me to my depths is Georges Rouault (German Expressionist, also one of the Fauves, b 1871 – d. 1958). I had already been introduced to his work online, but when I went to Santa Barbara last April for a Skip Lawrence workshop I saw an original and it took my breath away. Ever focusing on simplifying my life and art, no wonder i am so deeply drawn to Rouault. When I look at Rouault’s work – which i do often browsing online – the thought of late that came to mind was – Why Say More than is Necessary in a painting? Indeed. He also did many works in gouache which thrills my gouache-y soul (!) though is probably better known for his rich impasto oil paintings. For me, first I am sucker punched with emotion. I can’t really explain it, just that it is a powerful piece. The non-fussy brushstrokes, or better to call them what they are, pure expressive brushstrokes. The gesture is important….and you will see this in other works of his as well. He knew the human soul. A slight tilt of a head speaks volumes. Teeny bit of abstract background in lower right, and whatever it is over the figure’s head….well, it’s just interesting. Doesn’t call too much attention to itself, yet it is there. And extended halo? A spirit from invisible realms? I adore the mystery of it. Why Say More When You Can Say It With Less? Many of the brushstrokes were laid down and never touched again. Hard to do – leaving them alone that is! Muted evocative palette – i’m guessing yellow ochre, ultramarine, burnt sienna/umber, of course black and white. It seems pretty clear to me that Rouault unabashedly mixed his colors with black. Three cheers for Black! He often frames his paintings, but on the painting itself, forming a box around his subject. Just look at that little child bottom left – how moving a portrait, yet really take a close look at how minimally this figure is painted. A few mere rough shapes. Yet such a keen part of the story being told here. Another bit of mystery to me is that IF this is a painting of Christ healing someone (man on mat) then the Madonna and Child portrait hanging in background I find fascinating. Out of time and place, historically anachronistic, yet there. Like a Grace. 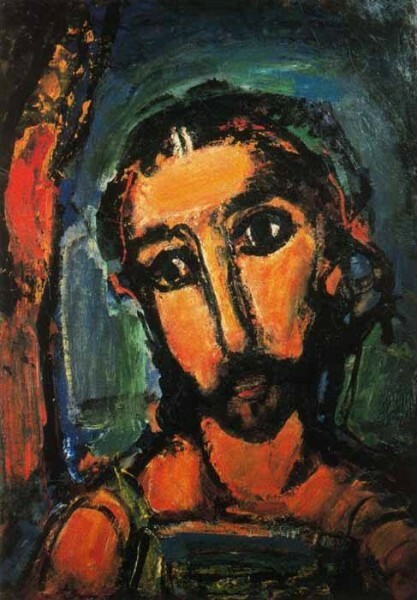 Another Face of Christ (he painted many). Strong black line – his signature style and his lines make me swoon. As you know, I love my black ink to start and revise my paintings. Watch me paint here. Color – vibrant in this one. Orange and blue, red and green complements. Gesture – that tilt of head. Abstract background keeps it interesting, sets context even without knowing what it is. Value pattern – always dramatic. Facial features – those eyes say it all, and look how primitively they are drawn. Why Say More When You Can Say Less? 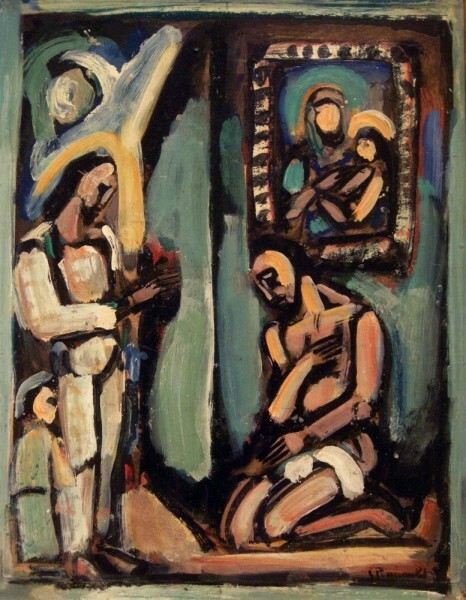 When I found out that Georges Rouault was a stained glass artist, it was a big AHA for me. Well, of course, that’s why he was so comfortable with heavy descriptive black lines. For me black ink and line is my MAP, and when I lose my way in a painting I go back and FIND MY WAY again with more black ink. This can happen a few times or more in a particular painting. And I do then obscure much of the line as I continue to paint with my gouache, but not all of it. I love the solidity that a good line gives a painting. 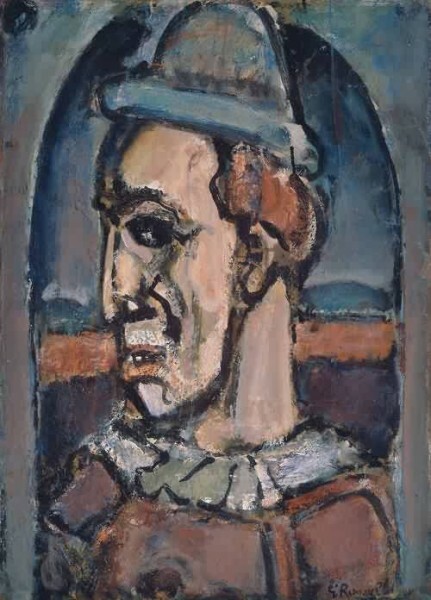 Rouault often painted clowns, and other characters about town, but is best known as one of the most renowned religious painters of the 20th Century. Hope that helps give you some inspiration to find an artist who speaks to you. Look long and deeply at your artist’s work and discover what it is that appeals to you. 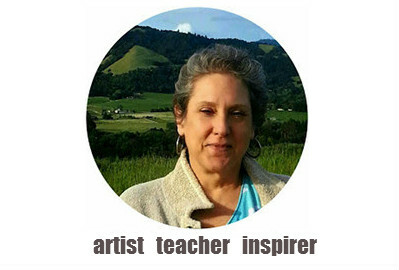 Examine his/her work – and then return to your easel and see what is birthed anew. Paint On!